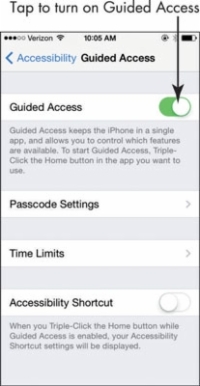 Guided Access is a feature that you can use to limit a user’s access to iPhone to a single app, and even limit access in that app to certain features. This feature is useful in several settings, ranging from a classroom, for use by someone with attention deficit disorder, and even to a public setting such as a kiosk where you don’t want users to be able to open other apps. 1Tap Settings and then tap General. You will see the General settings. 2Tap Accessibility and then scroll down and tap Guided Access. Then, on the screen that follows, tap Guided Access to turn the feature on. 3Tap Passcode Settings and then tap Set Guided Access Passcode to activate a passcode so that those using an app cannot return to the Home screen to access other apps. 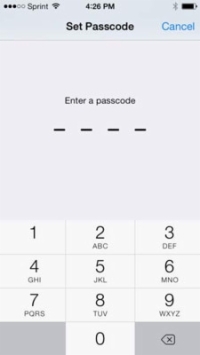 In the Set Passcode dialog that appears, enter a passcode using the numeric pad. Enter the number again when prompted. 4Press the Home button and tap an app to open it. 5Press the Home button three times. Sleep/Wake Button: You can put your iPhone to sleep or wake it up with three presses of the Home button. Volume Buttons: You can tap Always On or Always Off. If you don’t want users to be able to adjust volume using the volume toggle on the side of the iPhone, for example, use this setting. Motion: Turn this setting off if you don’t want users to move the iPhone around — for example, to play a race car driving game. Keyboards: Use this setting to prohibit people using this app from entering text using the keyboard. Touch: If you don’t want users to be able to use the touchscreen, turn this off. Time Limit: Tap this and use settings that are displayed to set a time limit for the use of the app. At this point, you can also use your finger to circle areas of the screen that you want to disable, such as a Store button in the Music app. 6Press the Home button three times. Then enter your passcode, if you set one, to return to the Home screen.